In our previous post we have mentioned about great success of our Turkish colleagues, they managed to launch e-learning portal and skills certification in the area of digitization and digital libraries. This development was based on ACCESS IT materials initially developed by PSNC Digital Libraries Team. 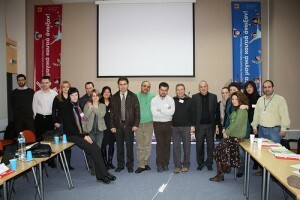 Educational program was launched on 10th of January. It had to be very busy period for our Turkish colleagues, yesterday we received a news that Turkish portal has now 895 registered users! We hope to hear about anatomy of such a great educational success during the ACCESS IT final conference which will be held in the end of March in Istanbul. Some photos from the tour can be found here. Once again we would like to thank to all who have helped us with the organisation of this tour! Ten program prac został zrealizowany przy wsparciu finansowym Komisji Europejskiej. Program lub publikacja odzwierciedlają jedynie stanowisko ich autora i Komisja Europejska nie ponosi odpowiedzialności za umieszczoną w nich zawartość merytoryczną. What is all this digitisation about and which objects should be digitised? How to create a digital repository? How to describe digital objects? How objects and metadata from digital repositories can be reused? How to (and why) prepare a repository for Europeana? How to set up a metadata aggregator? Should I know something more about digital preservation? Why to evaluate accessibility and usability of digital libraries? The training had 15 participants representing Greece, Serbia and Turkey. In the ACCESS IT project these persons will create in their countries centres of competence on digital libraries, trying to cause the increase of the amount of cultural heritage available on-line and visible in Europeana. On the basis of materials prepared for the training and conclusions from discussions and practical exercises an on-line course will be prepared. It will be the basis for wide training action for cultural institution employees in three mentioned countries. This training connected with certification is planned to reach to several thousands of people causing the increase of knowledge and practical skills in the digital libraries area. The training was described by regional press (1, 2, 3) and on the Flickr profile of the Veria Central Public Library some photos from the training were published. Veria Central Public Library is one of the largest public libraries in Greece. It takes many initiatives related to European cooperation and to the promotion of reading. Particularly worth to notice and recommend is the idea of Magic Boxes – a way to arrange the library space for the youngest readers, which was implemented in Veria Central Public Library at the end of 2008.